I’ve recently started to play around with OpenStack and decided the best way to do so would be in my home lab. During my first attempt, I ran into quite a couple of hiccups that I thought were worth documenting. In this post, I want to talk about the prep work I needed to do before I began the OpenStack install. It’s one of my home lab boxes. A 1u Supermicro with 8 gigs of RAM and a 4 core Intel Xeon (X3210) processor. The hard drive is relatively tiny as well coming in at 200 gig. To run all of the OpenStack nodes on 1 server, I needed a virtualization layer so I chose ProxMox (KVM) for this. ProxMox has a great article out there on this, but I’ll walk you through the steps I took to enable my hardware for nested virtualization. Note: You should first check the systems BIOS to see if Intel VT or AMD-V is disabled there. Note: Most of these commands are the same for Intel and AMD. Just replace any instance of ‘intel’ below with ‘amd’. If we reboot our VM and check the kernel modules we should see that both kvm and kvm_intel are now loaded. 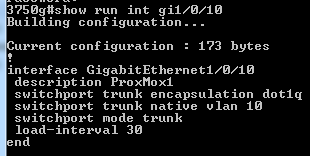 At first I thought as long as the VM NIC for the third interface (the trunk) was untagged, things should just work. 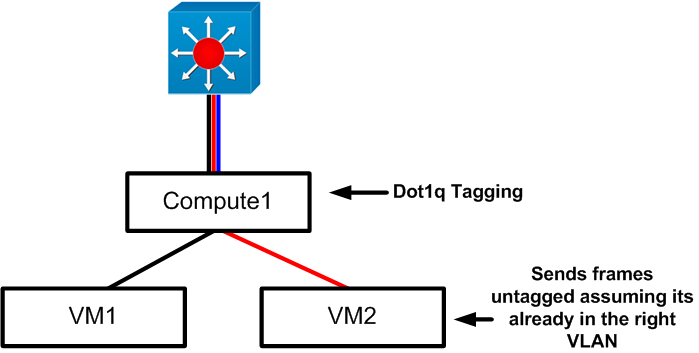 The VM would tag the traffic, the bridge on the ProxMox host wouldn’t modify the tag, and the physical switch would receive a tagged frame. Unfortunately I didn’t have any luck with that working. Captures seemed to show that the ProxMox host was stripping the tags before forwarding them on its trunk to the physical host. Out of desperation I upgraded the ProxMox host from 3.4 to 4 and the problem magically went away. Wish I had more info on that, but that’s what fixed my issue. What this does is tell the switch that any frames that arrive untagged should be a member of VLAN 10. So this solves my problem and frees me up to either tag on the VM NIC (as I do with net0) or tag on the VM itself (as I’ll do with net2) while having all VM interfaces a member of a single bridge. I cant stress the importance of starting off on the right foot when building a lab like this. Mapping all of this out before you start will save you TONS of time in the long run. In the next post we’re going to start building the VMs and installing the operating systems and prerequisites. Stay tuned! Any reason why you are using the ‘ide’ drivers for the hard drive and ‘e1000’ drivers for the virtual network ports? Ubuntu should have the necessary kernel support for the virtio storage and network drivers. They are supposed to be a lot faster. Hey man! Thanks for the comments. I had just built these VMs and not got to anything besides the network config so that’s one reason. Valid points though, Im curious why virtio isnt the default in ProxMox. Seems odd now that Im thinking about it. I had intentionally changed to E1000 drivers when I was troubleshooting trunking but they didnt make a difference. I missed the IDE driver entirely though. Good catch. Im wondering if they use IDE since it has a larger support base? I’ll try VirtIO for both and report back in the next post where I discuss building the VMs and the OS. yeah some of the defaults are kind of odd. It might also be worth looking into the ‘iothread’ options under the harddrive and ‘multiqueues’ under network. I know I looked them both up in the past, but there didn’t seem to be strong consensus as to whether they were needed or not. 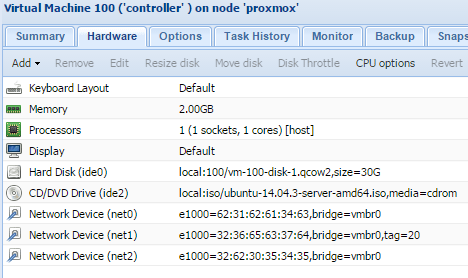 It would be nice to see Proxmox put out a performance tooling guide. Most of the options are kind of mysterious.